Sometimes a woman may not give that much thought to the topic of the hiking pants for the summer. The fact of the matter is that having the right hiking pants can greatly make or break a hiking experience that you are taking part of. There are a few things that you really should consider before you go out and make a purchase decision. The first thing that you need to know is that not all hiking pants are created equal. There are many things that you will want to make sure that you keep in mind when you head to the store or you go online to make a purchase decision. So before we talk about the best hiking pants for a woman to buy, let’s take a look at some of the things that you need to know about hiking pants in general. The first thing to know is that there are three types of hiking pants you can choose from. Regular hiking pants, convertible pants, and roll-up hiking pants. The difference between these is that convertible hiking pants allow the legs to be removed to create hiking shorts. Roll-up allows the legs to be rolled up to create shorts or a form of Capri pants. The next thing to think about is that of the materials that these are made from. Nylon along with a mix of some form of elastic material is what these days seem to make most of these pants. This helps to make the pants a lot stretchier and allow for freer movement for a woman when she is hiking. The more that you are able to move, the freer that you will fell and the further that you will be able to hike on an average day. One last thing that you need to make sure of thinking about is the weight of the pants that you are buying. this will be a vital thing to think about as it can be a heavy subject. You don’t want a hiking pant that is heavy and makes you feel like you are carrying a ton of boulders on your lower half. Your legs are what you need to rely on when it comes to hiking and therefore you don’t need to make a bad decision in your hiking pant choice. Sizing is another concern. Often times a person will not think about this subject and will buy a pant or short that is too tight and does not offer up plenty of space for you to move freely. Look at the sizes of the items offered and find the one that is slightly bigger than what you actually wear. this will be important as it will help you to have a loose fitting pant without it being too lose that they feel like they are about to fall off. Price is something that often times a person will not think about as they will just buy the first thing that comes to mind for them. it is just as important that you think about price as well as the other things to make sure that you are getting the best deal for all of your pants needs. It is okay for you to do a little shopping around and see if you can get a better deal as a number of places will have specials that you may not have known about. So without a further ado let’s see the four best women’s summer hiking pants for 2018. The North Face Women’s Paramount 2.0 Convertible is the first example of a pair of hiking pants that make a bold statement. These come in one color of Falcon Brown and also can be p[purchased in a number of sizes to fit women of any shape or size. One thing that many women that buy these pants will tell you is that they can allow a woman to move easily and will not constrict unlike a number of the other products on the market. The materials that these are made from will allow you to remain cooler than with other types of pants as the material breathes a lot easier than you might get from any other product on the market. Washing them is easy as they have very easy and generic washing instructions and are very easy to get clean. If you are in the market for a top of the line product, then you will want to give these a serious look at and consider them for your next purchase decision. Columbia Women’s Saturday Trail Short is a lot less like hiking pants and more of a hiking short for a woman to use while hiking. This is a product that is made 96% nylon and 4% elastane. This material combination allows for the shorts to move with the woman and will not hinder her when she is going over some rough terrain while on a hike. The best part of this product is that it is SPF rated and also has a lot of advantages that come from the world of resisting many types of stains that other products would normally fall victim to. Coming in a number of different sizes as well as colors, a woman will be able to find a product that will be perfect for them when they head out on a hike. If you are looking for a product that offers style, comfort and all for a reasonable price, then this is the ideal product for you to think about. Which leads us to the next product for you to think about when looking for a quality hiking pants alternative. PrAna Women’s Meme Pant is a great example of a product that has everything that you would normally expect from a hiking pant. Comfort, Style and five pockets that are built to last and handle anything and everything that the elements have to throw at it. This is one of the top stain resistant options that are out on the market for a woman to buy and wear. It is common that often times there will be stains that will get on your clothes just from the sheer elements that a hiker will encounter on a regular basis. Our final product – the Jack Wolfskin Women’s Activate pant is one that does not look like the traditional hiking pants that you would expect to find while searching for hiking pants for a woman. These pants are made from some of the lightest materials around and are very much able to breathe a lot easier than many of the products that a woman will come across while searching for something to go hiking in. While these do only come with 2 hip pockets, the construction of these pockets makes the pockets allow for you to easily place a number of things in them and take along with you. The materials are some of the best that you will find on the market and can actually make it feel like you are not wearing anything at all. 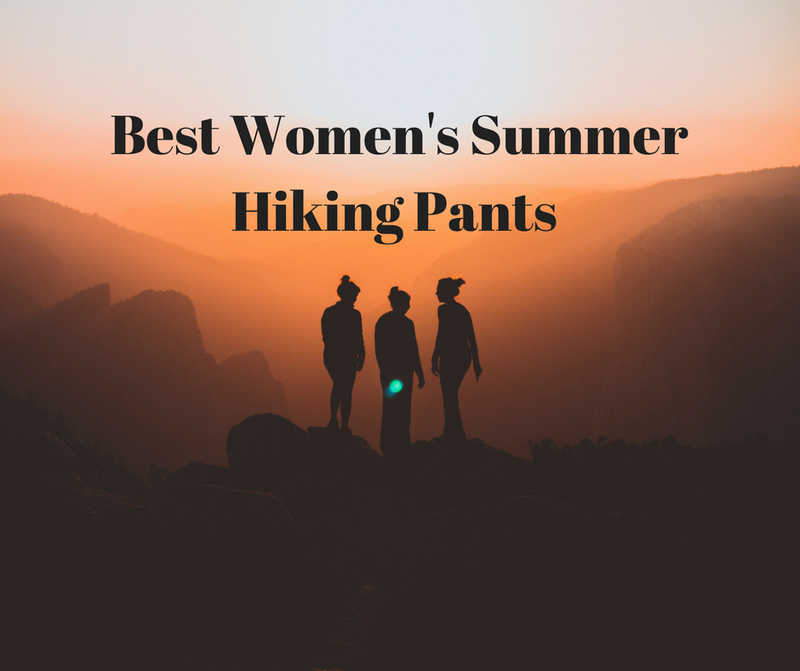 All of the above-mentioned products will make an excellent choice for a woman that is looking for the right pair of best women’s summer hiking pants. Don’t let a bad purchase decision be the thing that hurts your next hiking trip. The last bit of advice that you should keep in mind is the price that you will pay and any types of materials that the pants will be made from. It can be said that once you find a pair of hiking pants that you love, you will never buy another pair again. This is often times true and something that every woman will want to make sure that they keep in mind when going to make a purchase decision.